Eremurus or foxtail lilies are tall, stately perennials with fleshy, starfish like roots that will add height and interest to herbaceous borders. Eremurus are clump-forming perennials with rosettes of strap-shaped basal leaves producing dense racemes of small star-shaped flowers on erect leafless stems in early to midsummer. They are followed by round seedpods the size of marbles that bear winged seeds. Leaves and flowers grow from a central crown from which the fleshy roots radiate giving the bare root crow starfish like appearance. Eremurus originate from the dry grasslands and semi-desert of western and central Asia, therefore it can be difficult to mimic such growing conditions in the UK climate. They require free draining soil. Choose the sunniest spot in the garden and do not plant in frost pockets. Though hardy, the young spring foliage is prone to frost damage. Avoid windy sites if growing taller species or cultivars. The fleshy, shallow root system resents disturbance and competition from other plants. Keep soil cultivation (e.g. 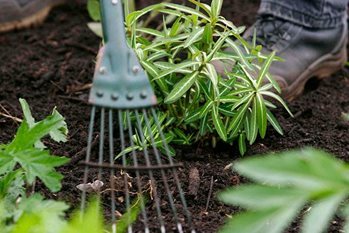 hand weeding or digging) close to the plants to a minimum to prevent accidental root damage. Ideally clear away any plants growing around them. They may cope with closer company of smaller bulbs or shallow rooted annuals. Bare root crowns are available in early spring or summer. Plant as soon as possible after purchase. If the roots appear dry, soaking them in water for a couple of hours prior to planting may help. Handle the brittle roots as little as possible. Prepare the site by incorporating organic matter such as garden compost. If the soil is heavier, to aid drainage, consider raising the soil level of the bed intended for planting. Create a shallow planting hole 15-20cm (6-8in) in depth and wider than the roots. Position the centre of the crown on a mound of coarse grit, sharp sand or soil, so the central growing point is just below the soil surface. If planting in clumps space the crowns 30-90cm (1-3ft) depending on the size and cultivar vigour. Mark the position of the plant with a cane or similar to avoid accidental damage when dormant. This would also mark a good spot for inserting a stake, if needed. Potted plants may be available in spring. Eremurus is not well suited for a long term container cultivation. Once in active growth feed with high potassium fertiliser such as sulphate of potash in spring. If plants are damaged by late frost or are not very vigorous, consider liquid feeding with a general fertiliser once a month in late spring and summer. Make sure that the plants are not prone to drying out when in leaf. The foliage will start dying down soon after flowering. When dormant in summer they enjoy dry conditions. Although hardy, eremurus can be damaged by waterlogged soil. Application of dry autumn mulch such as bark or gravel may be beneficial, but avoid covering the centre of the crown. Eremurus comes into growth early in the season and the shoots are prone to frost damage. Protect the new growth with fleece or cloches. Taller plants will require staking, but care must be taken not to damage the fragile roots when inserting the stake or cane. Unless seeds are required, once finished flowering the flower spike can be cut out at the base. At the end of the season wait for the foliage to die down before removing it. Propagate by fresh seed in the autumn; germination of older seed is likely to be erratic. Alternatively, sow stored seed in spring or early summer. Pot up seedlings individually when large enough to handle. Plant in the final position at the end of their second or third year. Seed grown plants will take between 3-5 years to flower. Mature eremurus clumps can be divided once flowering has finished and foliage died down. Care should be taken not to damage the fragile fleshy roots. Eremurus himalaicus: White flower, flower stem 2-2.5m (6½-8ft) tall. Spread 60cm (2ft). E. × isabellinus 'Cleopatra': Orange flowers, flower stem 1.5m (5ft) tall, spread 60-90cm (2-3ft). E. × isabellinus 'Pinokkio': Orange buds opening deep daffodil yellow flowers with bright orange stamens, flower stem 1.2m (4ft), spread 40cm (16in). E. robustus AGM: Pale peachy-pink flowers, flower stem 2.5-3m (8-10ft), spread 1.5m (5ft). E. stenophyllus AGM: Small yellow star-shaped flowers, flower stem 1-1.5m (3-5ft) tall, spread 60cm (2ft). E. ‘Romance’: Salmony orange-pink flowers, flower stem 1.2-1.5m (4-5ft), spread 60-90cm (2-3ft). Ruiter hybrid. E. 'White Beauty Favourite': Brilliant white flowers, flower stem 1.2m (4ft), spread 50cm (20in). Ruiter hybrid. Poor growth and lack of flowering is usually caused by the growing conditions. Planting on well-drained soils and in full sun is essential. Do not let other plants smother their foliage or compete with their roots. Do not buy crowns that appear desiccated, they may not perform well. Damage to the new growth by frost or slug and snails will weaken the plant. Protect new shoots with fleece if late frost is forecast. Liquid feed damaged plants with general fertiliser to boost growth. Failing to grow in subsequent years is likely to be caused by waterlogging of the soil or is due to root damage caused by soil disturbance. Taller plants may need staking.